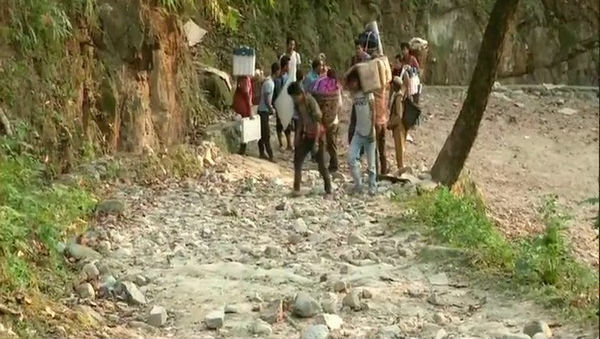 West Bengal, April 11: Three polling teams, after trekking for almost three hours, reached their designated polling stations situated approximately 3000 feet above ground level to conduct elections in Buxa Fort on Wednesday. Around 7,000 voters will cast their votes on Thursday in three polling booths, namely Buxar Duar BFP School (ward no. 11/224), Adma (ward no. (11/225) FVP School and Chunabhati Finish Mission Primary School (ward no. 11/226). Voters, too, will trek up the hill to cast their votes. Assembly Elections 2019 Phase 1 Live News Updates: Andhra Pradesh: List of constituencies where EVMs reportedly not working. Speaking to ANI, Tapan Saha, second polling officer, said, "To celebrate the biggest festival of democracy and to protect it we are here. Also, interestingly, voters here are always excited to participate in voting. "Three polling teams (comprising of presiding officers, polling staffs, security) had to trek a minimal of three kilometres and a maximum of eight kilometres to reach their designated polling stations. Approximately 22 porters carrying election kits helped the teams reach their respective destinations. When asked about the demands staged by polling staff to conduct voting, Presiding Officer Jharia Oram said, "We demanded security for our lives because we don't want to have the same fate as Rajkumar Roy whose body was found on a railway track after the panchayat polls in 2018." Lok Sabha Elections 2019 Phase-I Voting Live News Updates: Uttarakhand| CM Trivendra Singh Rawat Casts Vote in Haridwar. This time, polling staff had staged protests in various districts of West Bengal demanding central forces to be deployed for their security. West Bengal will go to polls during all seven phases, starting today. Counting of votes will take place on May 23.